This blog post is on notes about smoking and depression from The Tipping Point: How Little Things Can Make a Big Difference by Malcolm Gladwell. Smoking was never cool. Smokers are cool. Nicotine may be highly addictive, but it is only addictive in some people, some of the time. Since nicotine is known to relieve boredom and stress, people who are in boring or stressful situations are always going to smoke more than people who are not. As psychiatric problems increase, the correlation with smoking grows stronger. About 80 percent of alcoholics smoke. Close to 90 percent of schizophrenics smoke. Stickiness with a vengeance: not only do some smokers find it hard to quit because they are addicted to nicotine, but also because without nicotine they run the risk of a debilitating psychiatric illness. Nicotine releases dopamine to the prefrontal cortex of the brain, which is the pleasure center of the brain. It’s what people believe is responsible for the pleasure, the sense of well-being, associated with smoking, and that’s one of the reasons it’s so hard to quit. Nicotine also increases norepinephrine, and that’s the reason that when you try to quit smoking and you no longer get so much norepinephrine, you get agitation and irritability. Nicotine addiction is not an instant development. It takes time for most people to get hooked on cigarettes, and just because teens are smoking at fifteen doesn’t mean that they will inevitably become addicted. You’ve got about three years to stop them. The amount of nicotine found in five cigarettes which works out to somewhere between four and six milligrams of nicotine is probably somewhere close to the addiction threshold. Depression is believed to be the result, at least in part, of a problem in the production of certain key brain chemicals, in particular the neurotransmitters known as serotonin, dopamine, and norepinephrine. These are the chemicals that regulate mood, that contribute to feelings of confidence and mastery and pleasure. Drugs like Zoloft and Prozac work because they prompt the brain to produce more serotonin: they compensate, in other words, for the deficit of serotonin that some depressed people suffer from. Nicotine appears to do exactly the same thing with the other two key neurotransmitters dopamine and norepinephrine. 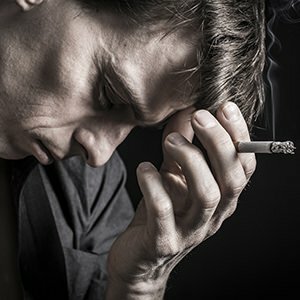 Those smokers who are depressed, in short, are essentially using tobacco as a cheap way of treating their own depression, of boosting the level of brain chemicals they need to function normally. This effect is strong enough that when smokers with a history of psychiatric problems give up cigarettes, they run a sizable risk of relapsing into depression.